A human spine is made up of more than 30 bones (vertebrae), held together by ligaments, muscles, and discs. It supports the weight of the human body and a healthy one should neither hurt, nor should it have any damages. While spending many hours sitting in front of our computers, we put our spine to serious tests. Sitting is one of the worst positions for the body to maintain (check "The health hazards of sitting" by The Washington Post), where an immense pressure is built on the spine. Prolonged sitting causes discomfort or even spine misalignment. The situation gets even worse when we are using laptops/ultrabooks too long without connecting it to an external display or without any stand, which assure the right height of the display, so that one does not have to bend their necks down. 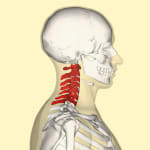 While sitting, the most exposed parts of the spine are: Cervical and Lumbar spines. 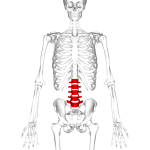 If your Lumbar part hurts, this could mean that your sitting position is incorrect. It might be a problem of the chair that you are sitting on or just wrong habits. Even if you have the most expensive, most ergonomic office chair recommended by everyone, you need to know how to sit on it. Problems with the Cervical part of the spine are mainly caused by improper desk height or the wrong position of the monitor. Neglecting the problem and your bad habits can lead to serious health issues in the long run! Read more about your spine here. Our spine needs activity. 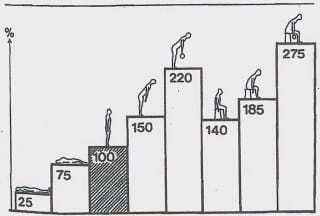 While getting up from a chair, we change the position of vertebras and intervertebral discs, which leads to the change in the exerted pressure. The standing position is the most natural one for the human body. While we are standing, our spine is “doing” a natural job, which it has to do normally in order to maintain our body in straight position. That’s where standing desks come to the rescue. 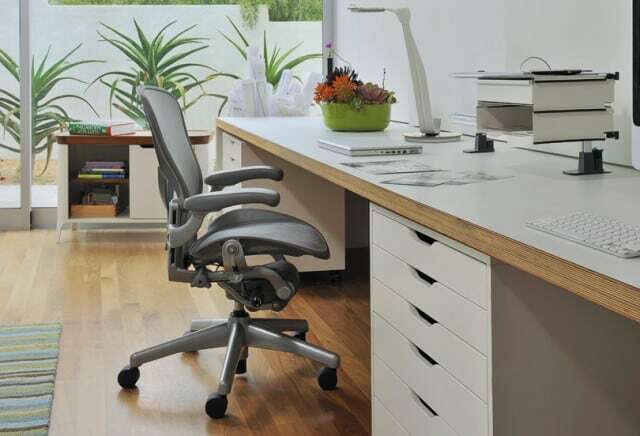 Having the possibility to change the height of the desk is a great way to improve the ergonomics of your workplace. Switching between sitting and standing throughout the work day or even just having the opportunity to lower/increase the desk’s height while seating, and adjusting it to your height, can be highly beneficial. There are plenty of really good articles focusing on standing desks only, I would recommend to take a look at: The Wirecutter, Lifehacker, but also some critical ones like this one. Unfortunately, there is a limited availability of the standing desks in Europe. I decided to try out [IKEA BEKANT standing desk](http://www.ikea.com/us/en/catalog/products/S19022530/), which is electrically adjustable, offered in many different sizes and variations. From my point of view, I would say that the most important feature the standing desk has to have is the ability of changing the height really quickly. When this process takes too long or it’s too complicated, you will probably not use it at all. A good office chair should be equipped with a couple of mechanisms and adjustment systems, that allow you to easily adapt it to your height and weight. Seat height – the seat must be high enough to let you have your feet flat on the floor, with thighs horizontal and arms even with the height of the desk. Seat width and depth – the seat needs to have such depth, so that while having your back against the backrest, the space between the back of your knees and the seat will be approximately the size of your fist. Lumbar support – as mentioned before, the lumbar spine has an inward curve which has to be supported by the backrest of a good ergonomic chair. Backrest – if it is separate from the seat, it needs to be adjustable in height and angle, if it is one piece, the backrest should be adjustable in forward and back angles with a locking mechanism to secure it from going too far backward. Seat and back material – the material on the seat and back should be made of the cloth fabric that breathes and is comfortable to sit on. Armrests – if present, they need to be adjustable so that your arms rest comfortably and shoulders are relaxed. It’s recommended to have the armrests at the height when the elbows are forming the right angle. Headrest – what surprised me most, a good ergonomic chair doesn’t need to have a headrest. If you are sitting on a chair and you feel you need one, that’s a sign that you are sitting in the wrong position or you are sitting too long – stand up and take a break! When choosing the right chair, it all depends on your available budget. A cheap chair doesn’t necessarily mean that it will harm you, as soon as you can adjust it right. Higher prices come with better materials used. The top chair companies are: Steelcase, Herman Miller and Humanscale. In this article you may find “the 13 best office chairs”, according to Gear Patrol, which are present in other articles as well, like on Lifehacker. My suggestion would be to go to a nearby store that offers a huge variety of chairs and spend a few moments there just to test them out. When I started to study this topic I thought that Humanscale Freedom (the chair that adjusts automatically to you) or Herman Miller Embody (check it out, it’s unbelievable!) chairs will be the best. I tried them out and I ended up with a classic – Herman Miller Aeron Chair. It was designed in 1994 and it quickly became an icon of ergonomic chairs – they were very popular with web startups during the late 1990s. In 2006 New York magazine called this chair “the Dot-Com Throne” and that’s the only chair I know that is featured in the Museum of Modern Art’s permanent collection in New York. Crazy, right? To reduce neck aches and fatigue, consider buying a monitor arm, which makes it easier to adjust the external screen. The optimal setting is when the eye level is around 2-3 inches down from the top of the monitor. The easiest (and the cheapest) solution is to put something below the display – couple of books, a small shelf, etc. However it might be too onerous and they might take too much space on your desk. 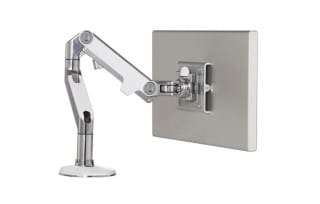 Since modern displays are thin and light, it’s advisable to use a monitor arm, for example like the ones from Humanscale. This element of ergonomic workplace is often overlooked, yet very important. Not only does it help to ease the pressure off your feet, they also help more petite users sit at a comfortable height while still being able to rest their feet flat in front of them while using a standard-height chair. A footrest is also advisable while standing in front of the desk. Putting one foot on it (in front of you), having bent your hip- and knee-joint, ensures the natural arrangement of your spine (in the form of 'S' letter). The next important factor of the ergonomic workplace is lighting. Poorly distributed light in the room or sitting in a dark room in front of a glowing display may have significant impact on your health! 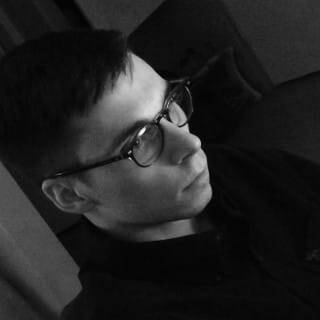 It’s hard for you to concentrate, you are sleepy all the time, thus you are not productive. A desk lamp might not be enough and if it is possible, you should take a look at the parameters of your ceiling lamp, like illumination (measured in Lux). A great article about Lighting Ergonomics can be found at Canadian Centre for Occupational Health and Safety web page. Make sure to also read the article about Eye Discomfort in the Office. One should not only take care of the ambient lighting, but also think about the display itself, which is emitting a blue glow. During the day, computer screens look good – they’re designed to look like the sun. But, at 9PM, 10PM, or 3AM, you probably shouldn’t be looking at the sun. Check out their application – it’s a must-have, available on all platforms! A short film from CNET – How To – Set up an ergonomic workstation. 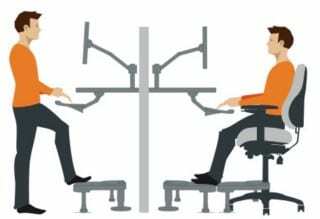 I hope that this brief introduction to ergonomic workplace made you think about this topic, that you want to learn more about it now, improve your own work environment, and that finally – you will feel much better every day! Most of what I’ve shared here, I learned the hard way – I spent too many years working on a 15” laptop and my back pains became unbearable. Take care of your body if you still want to enjoy sitting at your desk and not feel reluctant every time you have to start your work. Remember that good equipment will never be enough and you need to exercise, move, keep fit. Check out 8 tips that will make you a more active, healthier remote developer. Keep moving even more – go to the gym, swimming pool, whatever your preferences are, the rule is simple – move, move, move! At least a couple of times during the week, ideally every day. It’s good for your health, your wellbeing, you stay focused more easily, so you can be unstoppable at X-Team!